The number of mobile users has overtaken the number of desktop users and this makes businesses more oriented towards the use of mobile channels to target potential customers. The businesses have started making an investment in the development of mobile websites and mobile apps. Some companies are big enough to employ both mobile websites and apps while the other companies might have to choose the one that works best for accelerating their business growth. 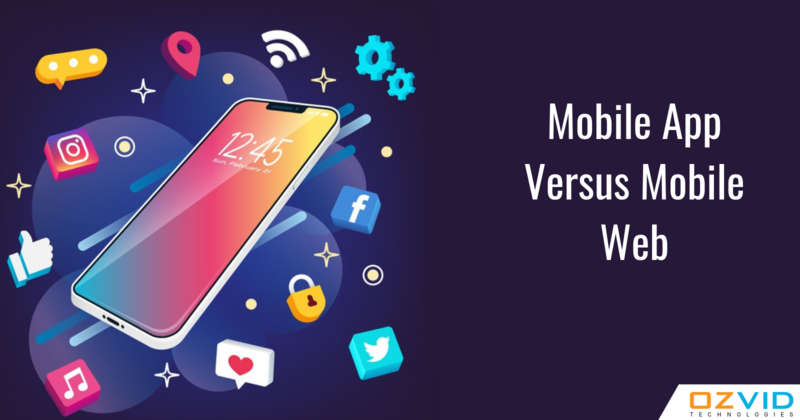 Generally, the businessmen make such choices on the basis of cost, usability, and other required features but to make the right moves it is essential to consider and compare the features of both the mobile app and mobile websites. Mobile apps come with better personalization: Personalization helps the user in making tailored communication as per their need, interest, behavior and more. The mobile apps offer a more personalized experience. It helps the user to set their preferences and also help in tracking and observing user engagement. Also, the mobile app is greatly used to detect the location of the user in real-time. Along with providing better user experience the app also helps in improving conversion rates. Thus mobile app offers a better experience over the mobile web. Easy to send and receive notification: With time the email has lost its effectiveness as a communication tool. The businesses are therefore opting for mobile app notification to communicate across different platform. The notifications are of two types: push and in-app notifications. It offers a better communication platform with less intrusive manner. In-app notification is the one that the businesses only receives when they open the app. Seamless use of mobile features: Mobile apps along with its own functionalities also tends to utilize the features of mobile devices like a camera, contact list, phone calls, GPS, accelerometer, etc. These device features make an app more interactive and reduce the efforts of the users. These features shorten the time of performing a certain task in an app and help in boosting up the conversion rate. Can work offline: Although many of the features of the mobile app require internet connectivity to be performed still there are much basic content and functionality that can be done even in the offline mode. Offer Better Experience: Since there is a vast difference between a mobile app and mobile web in terms of offering branding experience, the mobile app offers new and unique branding styles that differ from the usual branding style of the company's website. Build a Brand Presence: Since most of the users spend the maximum time of their day in using their mobile devices. The regular encounter of users with mobile apps increases the chance of branding opportunity of the app. Since developing a mobile website and mobile app is a costly affair, it is, therefore, essential to pick the one that works best for your business growth. Although, both have their own pros and cons it is beneficial to opt for developing a mobile app from the best mobile app development company. This is because it offers more personalization, operational efficiency, and other exclusive benefits.